This is another piece of candy that I picked up at the Philly Candy Show. 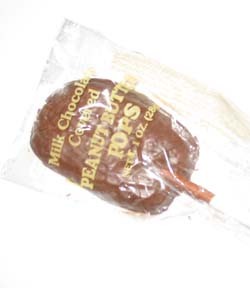 Manufactured by the Blasius Candy Factory in Philadelphia, PA. Their candy seems to be pretty popular, at least around where I live, but I couldn’t find a website for them. I know I see their Molasses Pops all over the place, so someone must be buying their stuff. Weighing 1 oz., the candy was a little smaller than a credit card, and fairly thin. It had a very sticky, almost taffy appearance and texture to it. While I am normally a sucker for peanut butter and chocolate in pretty much every form, I just couldn’t get behind these. Something about them seemed so..fake. Almost like the pop was flavored to taste like peanut butter and chocolate, but not actually made of them. While I’m not necessarily a fan of these, some of you might be more into them, and if you’re in the Philly area you can pick them up at their store located at Blasius Chocolate Factory, 1849 E. Venango St., Philadelphia, PA.
secret in Phila. ask anyone who grew up there…..